This holiday season a lot of people will be spending their holiday vacation in their hometown while others prefer to travel and explore any hot destination in their RV. Yes, there are some prominent people and celebrities here who own an RV. 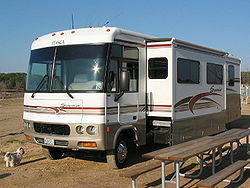 Recreational vehicle or RV is a type of motor vehicle equipped with living space and amenities found in a home. In US, RVing has become the latest trend among travelers. If ever we can afford to buy I would be glad to have a recreational vehicle. Who wouldn’t want to own a vehicle that is so comfortable and feels like you’re always at home? Anyway, my only concern about this vehicle is if RV repairs experts and parts are readily available here.